Today, Santorini is a major tourism hotspot in Europe. Thousands of people from all over the world flock to this island during the summer months to enjoy the mild Mediterranean weather and the Aegean sun. The physical beauty of the island and the ancient sites therein, such as the Minoan settlement at Akrotiri, also attract the crowds to visit it. 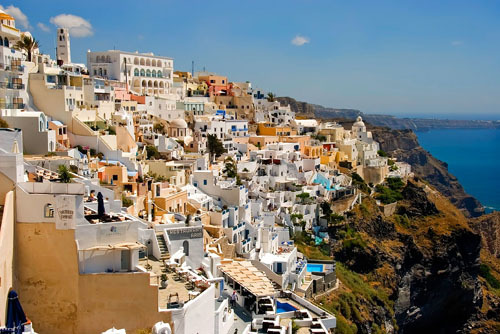 Among the biggest villages on the island are Oia, Perissa, Kamari, Imerovigli, Emporio, Therasia and Pirgos. Fira, though, is the commercial and economic centre of Santorini. Fira is also the most cosmopolitan one, where restaurants, bars, cafes, and tavernas are plenty to fulfil all the different tastes of the visitors of Santorini. The nightlife on the island is truly vibrant. The people of Santorini, nonetheless, try to preserve their cultural heritage by staging folk festivals and other traditional activities and promoting it this way to the visitors of the island. While tourism is the biggest income-generating sector of Santorini’s economy, the islands also have a flourishing wine industry, which produces some exquisite wines. Santorini is breath-takingly beautiful, culturally rich and vibrantly alive. It is no wonder that people who visit the island of Santorini cannot help but fall in love with the place, simply because it is a diamond shining upon the Aegean Sea.